Now that's money you can justify spending. There's now an excuse to get extra silly this silly season and it comes in the form of a gin advent calendar. Yes, you read that correctly -- an advent calendar that has ousted chocolate and brought in the gin. The people at Gintonica created the calendar which includes 24 different types of Australian craft gin ready to try each day of December. The various gins come from five different Australian states and represent 21 distillers. The bottles are 50 millilitres in size. The calendar also includes serving suggestions and tasting notes from the distillers and a few gin cocktail recipes. Traditionally, advent is the season before Christmas during which Christians prepare for the coming of Christ. The name 'Advent' itself comes from the Latin word 'adventus' which means 'arrival'. The season includes the four Sundays before Christmas and is observed using a wreath with four candles -- one candle for each week in the season. Each Sunday, a new candle is lit as Christmas approaches. Of course, the Advent season is celebrated by many people, religious or not. Advent calendars are often the highlight of this time for children, as they can eat a little chocolate each day. All over the world, Christmas markets pop-up in town squares and main streets, decorations appear and trees go up. In the warmer weather, many Aussies choose to check out the light displays in their local areas, or to travel a little further afield and visit some of the more extravagant houses. For most of us, Advent is a time to catch up with family and friends and attend Christmas parties among the mad dash from store to store to get that Christmas shopping done. 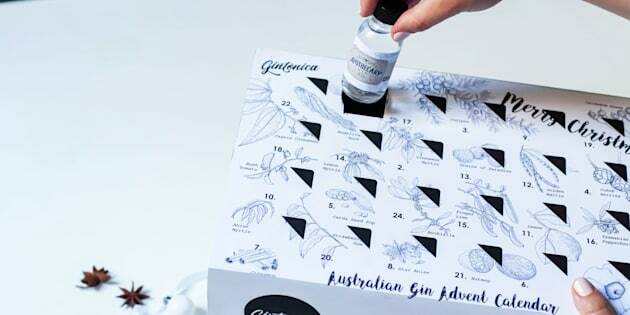 The Australian Gin Advent Calendar is available for purchase via the Gintonica website, however they can only be shipped to locations within Australia. Orders will be shipped before December 1, so you won't need to play catch up once the final month of 2017 ticks around. The calendar retails for $295 and over 70 percent of the stock has already been sold. Booze Advent Calendars, Because Why Should Kids Have All The Fun?